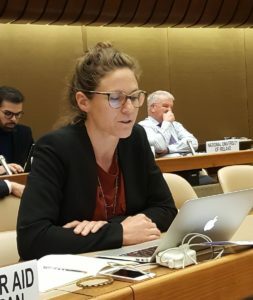 This week, states are meeting in Geneva at the UN to discuss their work under the Convention on Certain Conventional Weapons and emerging issues for this framework, which exists to ban or restrict the use of weapons technologies (other than biological, chemical and nuclear) that have particularly unacceptable effects. We are pleased that the HCPs have set aside time to discuss how relevant developments in science and technology may be addressed under the Convention. In his report on Current developments in science and technology and their potential impact on international security and disarmament efforts, the UN Secretary-General has called for vigilance ‘in our understanding of new and emerging weapon technologies that could imperil the security of future generations’. And he has invited consideration of ‘strategies for mitigating risks and preventing undesired foreseeable impacts on security’. The working paper submitted by India and Switzerland raises a number of questions that could usefully be considered in the framework of the CCW, including, first and foremost, to reach a shared understanding among HCP on what ‘S&T issues’ and ‘broader trends’ are of particular relevance to the Convention. First, in terms of maintaining the norms enshrined in the CCW, we should be mindful of the potential for developments in science and technology to challenge or blur established normative boundaries and technological categories. There is a risk that novel materials or devices create the effects of prohibited weapons or effects that parallel established concerns whilst arguably being outside of the scope of written prohibitions. For example, chemical, biological and physical properties merge at the nanoscale, making some traditional regulatory distinctions uncertain. What implications does this have for conventional weapons control? Do nanomaterials that are not readily detectable or removable from human tissue comply with the letter and spirit of CCW Protocol I? Do miniaturized missiles and similar explosive projectiles run counter to the prohibition on the use of exploding bullets? And how should we view technologies that target the human senses, such as hearing, in light of the existing prohibition on blinding laser weapons formalized in CCW Protocol IV? Second, S&T developments may raise wholly new concerns that evoke a moral disquiet and require more detailed analysis and consideration in order to identify and address the source of that unease. Discussions on autonomous weapons provide an example of this. Wednesday’s side-event, that we co-organized with the Swiss Federal Department of Foreign Affairs and UNODA sought to explore avenues for constructive engagement. The discussion highlighted that technological developments are driven by people, and so we, as people, also have the capacity to shape those developments towards the best interests of society. to ensure they are in a position to realize the potential benefits offered by advances in S&T to strengthen conventional weapons control. Only by staying abreast of innovation in science and technology and engaging with various stakeholders can the CCW maintain trust in its effectiveness to achieve the objectives expressed in its preamble: uphold the principles of humanity, contribute to disarmament and build confidence among States with a view to promoting peace.